ABAG Online - One of 560 regional planning agencies across the nation working to solve problems in land use, housing, environmental quality, and economic development. Assessment Appeals Board - An independent agency, separate from the Assessor's Office, established to decide disputes between the Assessor's Office and property owners. It is the duty of the Assessment Appeals Board to equalize the valuation of the taxable property within the City and County of San Francisco for the purpose of taxation. Assessor-Recorder - Recordation of documents; valuation of property. Location: City Hall, 1 Carleton B. Goodlett Place, San Francisco, CA 94102; (415) 554-5596. Board of Appeals - A quasi-judicial body created originally under the Charter of 1932, whose mission is the processing, hearing and deciding of appeals of departmental decisions involving the granting, denial, suspension, or revocation of permits, licenses, and other use entitlements by various commissions, departments, bureaus, agencies and officers of the City & County of San Francisco. The granting or denial of variances and other determinations by the Zoning Administrator, and discretionary review decisions and downtown building authorizations of the Planning Commission are included. Location: 1660 Mission, Room 3036, 94103; (415) 575-6880. Board of Equalization: State of California - Tax administration. Board of Supervisors - 401 Van Ness, Room 308, 94102; (415) 554-5184. Building Inspection - Location: 1660 Mission, 94103. General Information: (415) 558-6088. Bulding Inspection Division: (415) 558-6096. Commission: (415) 558-6164. Building Permit Status: (800) 473-2534. City of Berkeley (CoBWEB) - CoBWEB comprises all documents, databases, log files, web pages, and other information and materials residing on any Berkeley city-owned web server made accessible to the public. City of San Jose - Official San Jose city government website. Cityspan - Official web site of the City and County of San Francisco. Consumer Assurance Department - Consumer protection. (Ph: 415-824-6100). County Clerk - In the County Clerk's office, people and businesses file documents which relate to: names of businesses; marriages; domestic partnerships; notaries public; environmental impact reports; and others. (Ph: 415-554-4950). District Attorney - Juvenile, criminal and special prosecutions; family violence; bad check enforcement; investigations. (Ph: 415-553-1752). Mayor - Location: 1 Carleton B. Goodlett Place 94102. Administrative Offices: (415) 554-6141. Mayor's Ofice of Housing and Community Development - Provides financing for the development, rehabilitation and purchase of affordable housing in San Francisco. Also see Affordable Housing Developments in San Francisco page. MUNI (Municipal Railway) - Location: 949 Presidio, 94115; (415) 673-6864. Munisource - Largest collection of municipal government related infomation on the Internet with direct links to 3,500 official municipal sites in 44 countries. Office of the City Attorney - Official site: Dennis J. Herrera, City Attorney. Office of the Mayor - Official page. Planning Commission- 1660 Mission, 5th Floor, 94103. Planning Department - 1660 Mission, 1st Floor, 94103. Port of San Francisco - Responsibilities include promoting maritime commerce, navigation, and fisheries; restoring the environment; and providing public recreation. Public Works 1 Dr. Carlton B Goodlett Place, City Hall, Room 348, 94102; (415) 554-6920. Email: dpw@sfdpw.org. Raker Act, 1913 - This is the Raker Bill, which eventually became the Raker Act, granting the city of San Francisco the right to dam the Hetch Hetchy Valley as a reservoir, and the unfulfilled right of municipalized electricity for the city. This was the last of several Senate hearings held on this contentious issue between 1909 and 1913. The hearing took place on September 24, 1913. Recreation and Park Commission - Location: McLaren Lodge, Golden Gate Park, 501 Stanyan, 94117; (415) 831-2750. Recreation and Park Department - Location: McLaren Lodge, Golden Gate Park, 501 Stanyan, 94117; (415) 831-2700. General Manager: (415) 831-2701. San Franciscans for Clean Government - A grassroots group of citizens interested in a healthy democracy and concerned by backroom deals at SF City Hall. San Francisco Administrative Code Chapter 12H: Immigration Status - San Francisco's sanctuary ordinance. "No department, agency, commission, officer or employee of the City and County of San Francisco shall use any City funds or resources to assist in the enforcement of federal immigration law or to gather or disseminate information regarding the immigration status of individuals in the City and County of San Francisco unless such assistance is required by federal or State statute, regulation or court decision." San Francisco Bay Conservation and Development Commission (BCDC) - The federally-designated state coastal management agency for the San Francisco Bay segment of the California coastal zone. This designation empowers the Commission to use the authority of the federal Coastal Zone Management Act to ensure that federal projects and activities are consistent with the policies of the Bay Plan and state law. San Francisco Bay Conservation and Development Commission - California state agency whose mission is to protect San Francisco Bay. Also see Partner Agencies and other Public Interest Groups, a listing of links to the Commission's partners in the work of protecting and enhancing San Francisco Bay. San Francisco City and County Port Code - Under the Burton Act and Charter Section B3.581, the San Francisco Port Commission has the complete and exclusive authority to manage, regulate and control the harbor of San Francisco and to do all things it deems necessary in connection with the use, conduct, operation, management, maintenance, regulation, improvement and control of Port property. The Port has important interests in regulating activities on public access areas of Port property to protect visitors from safety hazards, prevent damage to theproperty and facilitate special event coordination. San Francisco City Department and Agencies - All City and County agencies and departments that have a web site available online. Committees, commissions and other entities are grouped by related major agencies. 311 Services Directory - Find a City service. Submit - Make over 100 service requests such as reporting a pothole, graffiti, etc. Track Form - Track the status of your request. San Francisco Department of Aging and Adult Services (DAAS) - Assists older and functionally impaired adults and their families to maximize self-sufficiency, safety, health and independence so that they can remain living in the community for as long as possible and maintain the highest quality of life. Coordinates an integrated, comprehensive range of social, mental health and long term care services. San Francisco Department of Building Inspection - The regulatory building safety agency responsible for overseeing the effective, efficient, fair and safe enforcement of the City and County of San Francisco's more than 200,000 commercial and residential buildings. San Francisco Department of Health - The Department achieves its mission through the work of two Divisions - the Community Health Network (CHN) and Population Health and Prevention. The CHN is the City's health system and has locations throughout the City including San Francisco General Hospital Medical Center, Laguna Honda Hospital and Rehabilitation Center, and over 15 primary care health centers. The Population Health and Prevention Division has a broad focus on the communities of San Francisco and is comprised of the Community Health and Safety Branch, Community Health Promotion and Prevention Branch, and the Community Health Services Branch. San Francisco Ethics Commission - Serving the public, SF city officials and employees, and candidates for public office through education and enforcement of ethics laws. 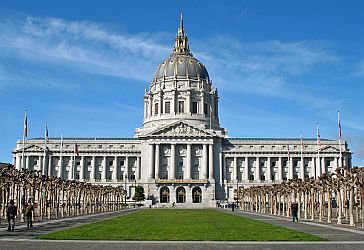 San Francisco Government - Links to major institutions and related services of city government of San Francisco. San Francisco Municipal Codes Online - This online version of the San Francisco Municipal Codes is maintained by American Legal Publishing Corporation. San Francisco Municipal Transportation Agency (SFMTA) - SFMTA manager and operates the entire surface transportation network that encompasses pedestrians, bicycling, transit, traffic and parking and regulates the taxi industry. San Francisco Planning and Urban Research Association (SPUR) - A San Francisco public policy think tank. San Francisoco Planning Department - Official page with information related to the activities, programs and resources of the Planning Department. San Francisco Police Department - The Metro Division is comprised of five district stations encompassing downtown San Francisco. Areas and neighborhoods serviced include the Marina, Civic Center, North Beach, Chinatown, Tenderloin, South of Market, and the Mission district. The Golden Gate Division is comprised of district stations encompassing the outer areas and neighborhoods of San Francisco, and the Traffic Company. Areas and neighborhoods serviced include the Richmond, Sunset, Outer Mission, Ingleside, Excelsior, Bayview, and Hunter's Point. The Traffic Company's duties extend Citywide and include traffic accident investigation, traffic enforcement programs, dignitary escorts, parades, and controlling traffic flow during athletics events. (Ph: 415-553-0123 or 911 for emergencies). San Francisco Public Works - Responsible for the care and maintenance of San Francisco's streets and infrastructure. The department designs, builds, resurfaces and cleans streets; plants and maintains trees; designs, constructs and maintains city-owned facilities; conducts sidewalk and roadway inspections, constructs curb ramps, provides mechanical and manual street cleaning, removes graffiti from public property; and partners with the diverse neighborhoods in San Francisco. See Projects page. San Francisco Rent Board - Created in order to safeguard tenants from excessive rent increases and, at the same time, to assure landlords fair and adequate rents consistent with Federal Anti-Inflation Guidelines. Also see San Francisco's Rent Ordinance: Chapter 37 of the San Francisco Administrative Code. SF Public Utilities Commission (Water Department) - Location: 1155 Market, 4th Floor, 94103; (415) 554-3155. Sheriff's Department - Administers San Francisco's six county jails. 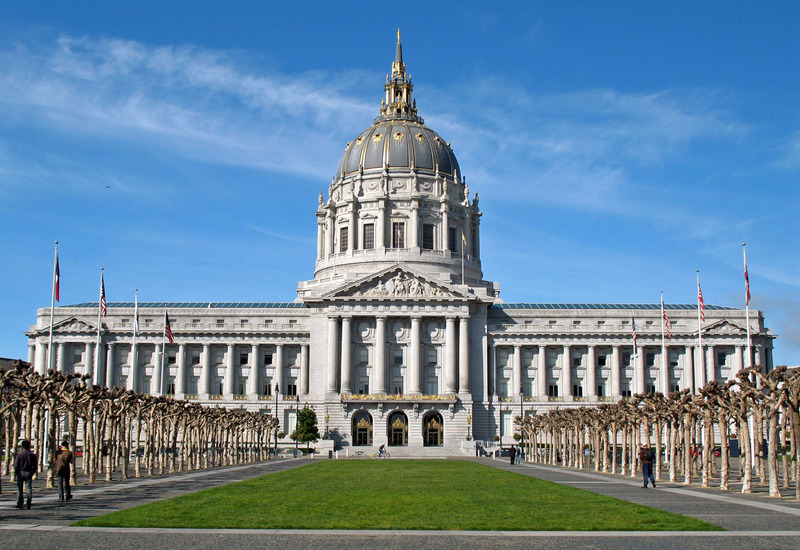 Provides security to the civil and criminal courts, and to San Francisco's City Hall. (Ph: 415-554-7225). Superior Court of California, County of San Francisco - Official site. Located at 400 McCallister Street. Civil (Ph: 415-551-4000). Criminal (Ph: 415-553-1159). See the San Francisco Superior Court Online Services for Probate, Complex Litigation, and General Civil information. Also see: San Francisco Superior Court Staff and San Francisco Superior Court Judicial Assignments. Senator Barbara Boxer - U.S. Senator from California, Senator Boxer serves on Senate committees on Commerce, Science, and Transportation, Environment and Public Works, Ethics, and Foreign Relations. Senator Diane Feinstein - U.S. Senator from California, Senator Feinstein serves on Senate committees on Appropriations, Intelligence, Judiciary, and Rules and Adminnistration. SFGov - Official website for the City and County of San Francisco. Sunshine Ordinance Task Force - Provides information to City departments on appropriate ways in which to implement the Sunshine Ordinance (Chapter 67 of the Administrative Code). Also see Sunshine Ordinance, Section 67. Superior Court of California for the County of San Francisco - Official site. Treasurer & Tax Collector - Serves as the banker, tax collector, collection agent, and investment officer for the City and County of San Francisco. This webpage last updated on Friday, October 14, 2016 11:40 AM.